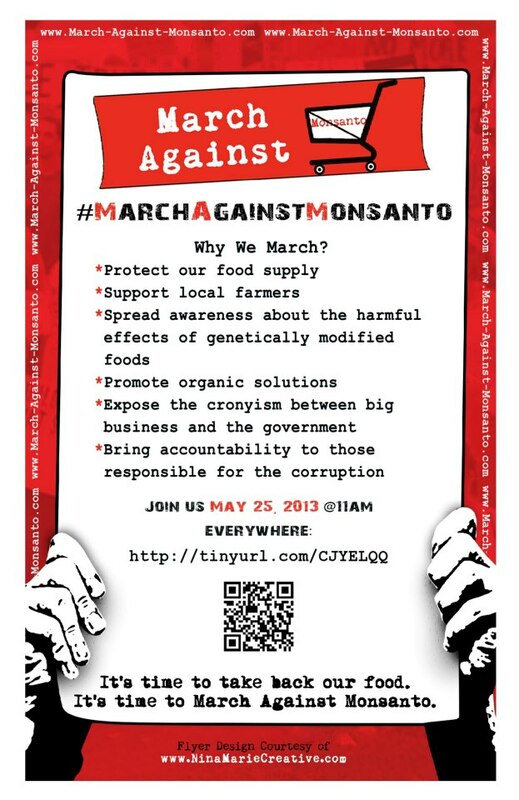 Activists are planning a worldwide day of protest on Saturday against the multinational biotech corporation, Monsanto. According to director Nick Bernabe, the movement, dubbed the "March Against Monsanto," was "started by a handful of millenials with a passion for change." The aim, Bernabe said, is to "bring awareness to [genetically modified organisms] GMOs and the health effects that they’re causing and bring about some solutions about what people can do to take back their food supply." An estimated 200,000 people will take part in the protests across 40 countries, including in 48 U.S. states. A full list of the events taking place around the world can be found here. The day of protest follows recent developments in Congress which have helped entrench the power and influence of companies such as Monsanto when it comes to GMO foods. Given the failure of lawmakers to protect the interests of the public against the corporate greed of Monsanto, the growth of a small, grassroots event into a worldwide protest movement is not surprising, and is welcome. In March, Congress passed a provision dubbed the "Monsanto Protection Act," an amendment quietly slipped into budget legislation which "effectively allows Monsanto and other companies that use GMOs to plant and sell genetically altered products even if legal action is taken against them." The move came after federal courts had ruled that the Department of Agriculture acted too quickly in approving the sale of GMO crops and did not adequately consider the potential harm that they might have. Unsurprisingly, the ruling prompted a backlash from the biotech industry, resulting in the provision passed by Congress. Democratic Senator Jeff Merkley of Oregon called it "one of the most outrageous special interest provisions in years." On Thursday, the Senate also rejected a bill that "would have allowed states to make their own decisions on whether or not GMO foods should be labeled – without mandating any action." Senators voted 71 to 27 against the amendment, despite the bill&apos;s sponsor, Independent Senator Bernie Sanders of Vermont noting that it is a "fairly commonsense and non-radical idea" given that many other countries around the world required GMO foods to be labelled and that the Food and Drug Administration already requires over 3,000 different ingredients to be labelled in food products. Furthermore, in Europe, eight countries (Austria, Bulgaria, France, Germany, Greece, Hungary, Luxembourg and Poland) have already banned Monsanto&apos;s MON810 maize crop and other forms of GMO crops. Italy has also announced plans to introduce a ban, while many regions and municipalities - including in Belgium, Finland, Italy, Latvia, the Netherlands, Portugal, Romania, Slovenia, Spain, Sweden and the UK - have defined themselves are GMO-free zones. And yet U.S. states are not even allowed the option to simply label GMO foods. - "Research studies have shown that Monsanto’s genetically-modified foods can lead to serious health conditions such as the development of cancer tumors, infertility and birth defects. - In the United States, the FDA, the agency tasked with ensuring food safety for the population, is steered by ex-Monsanto executives, and we feel that’s a questionable conflict of interests and explains the lack of government-led research on the long-term effects of GM products. - Monsanto&apos;s GM seeds are harmful to the environment; for example, scientists have indicated they have contributed to Colony Collapse Disorder among the world&apos;s bee population." Amidst the continued concerns surrounding the safety of GMOs and the power of companies such as Monsanto in the agricultural industry, given the lack of debate on the issue in Congress, the conflicts of interest, a government that is largely beholden to corporate interests, it is no surprise that people are being forced to take to the streets in order to make themselves heard.